Look what traveled to Aruba with us! 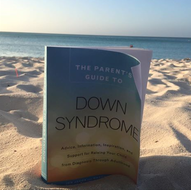 Book reviewer I am not, but I was recently asked to take on this task by our friend Jen Jacob, co-author of the new book “The Parent’s Guide to Down Syndrome” with Mardra Sikora. It was my absolute pleasure, as I had pre-ordered a copy of this book months ago and eagerly awaited the arrival of the Amazon Prime box at my door step. To be perfectly transparent, it was during this waiting period that Jen reached out and asked if I would be willing to review the book. By agreeing, I was forwarded a PDF copy of the book for free, but the old-school reader in me just couldn’t bring myself to read it on my computer or iPhone or iPad. I just couldn’t do it. I decided to hold onto that file just in case my hard copy didn’t arrive in time for me to honor my commitment for the review. Have no fear, the book arrived in the nick of time, just before a few short trips over the holidays. First, I have to say that knowing Jen a little bit prior to the release of the book helped me know that I’d be reading something by someone whose perspective on Down syndrome is very personal. Jen is more than just an author on a book about Down syndrome. To that effect, so is Mardra. Both of these women are proud moms of kiddos with Down syndrome. I have the pleasure of being in many of the same private social media groups as Jen as our sons are relatively close in age. Mardra’s son is a bit older, so her perspective on what’s coming for those of us with younger kids with Ds is invaluable. There is so much information “out there” about Down syndrome. Google can be your friend, and it can be dangerous. Paul and I spent much of the first hours after Isaiah was born (and hearing “Down syndrome” as a possible diagnosis for our son for the first time) on the Internet. Googling. Reading. Learning. Depending on which way Google sent us, Paul might say “freaking out!” My exposure to people with special needs was quite a bit greater than Paul’s. In fact, I’d venture to say it’s likely greater than the average adult. I have an amazing little sister who happens to be deaf. I was a young child when Mary-Beth was diagnosed as profoundly deaf at 9 months of age, and I grew up in a home with parents who were committed to fully integrating Mary-Beth into our family, with her friends, in school, in our community, etc. We never looked at Mary-Beth as a diagnosis. She was and still is “just” my little sister. She’s also a million other amazing things. She’s a wife. A mom. A college graduate. A beloved employee at her job at the University of Denver in Colorado. She’s many things, but deafness does not define her. This introduction to acceptance and inclusion early in my life by my family through this gift of an amazing little sister opened my heart in ways I am so thankful for now. I had a passion for the Special Olympics growing up and explored that passion deeper with friends as entered college. I continued to volunteer after finishing school and spent some of my favorite times in young adulthood with my friends at the Special Olympics. After Isaiah’s birth, many of my high school classmates reached out to remind me about our high school friend, Janet B., who happened to have Down syndrome, and about how much time we spent together. It was a privilege to send time with Janet and learn from her. I look back now and am so thankful that God placed all these people and events in my life then in preparation for what would be our greatest gift as parents, our perfect little boy. Paul’s experience with and exposure to people with special needs was very limited growing up. I believe Paul would tell you limited = ZERO. We grew up in different states, worlds apart in how the educational system was structured back then, and light years apart in how inclusion worked in our differing schools/states. The words “Down syndrome” were only recognizable as words to Paul, but he had no reference point. That led to fear. “Perhaps you have just heard that your child has Down syndrome. You may still be reeling, your mind packed with conflicting and confusing thoughts. You love your child but may be unsure of the future. Yes. YES! I wanted to scream from the rooftops reading these short sentences. YES! Regardless of your situation, it is very likely that you are experiencing these feelings. All of them. Regardless of how you process the diagnosis someone gives you for your child, one thing is for certain: as a parent, you LOVE your child. Period. That’s the most important thing. You can love AND still be filled with uncertainty, confusion, fear, all of it! What I love about Jen and Mardra’s approach is the acknowledgement that starts on page 1 and continues through the entire book that it is OK to feel whatever you are feeling. Going deeper, as you read through the uniquely designed sections of the book, divided into three parts: 1) The Basics, 2) The Journey and 3) You Are Not Alone, you are constantly reminded through first-person accounts that everyone processes and deals with not only hearing and dealing with the diagnosis of Down syndrome differently, but we all PARENT differently. It’s a constant reminder throughout the book that we’re all still just trying to navigate this whole parenting thing, which is challenging enough, is it not? As parents of a child with Down syndrome, your journey is just going to be a little different. That’s it. One of my favorite parts of the book is the tone. Not the tone of just a few words or paragraphs or even chapters. It’s the tone of the entire book. It’s great that you are reading this book and learning about other families and their experiences. It’s more than great. And I wish I’d had this book when Isaiah was born, although I can’t promise I would have read it. We were given a LOT of information about Down syndrome immediately following Isaiah’s birth and we made a personal choice as parents to put most of that information aside and focus on our little boy. We dove deeply, quickly, into providing for his needs, setting up therapies, etc., but I can tell you that the other Down syndrome related materials and books that very well-meaning people provided to us are still sitting in our bonus room collecting dust – to this day! Had I read this book when Isaiah was born, it could have been a one stop shop for me & Paul. I truly believe that. Chapters 1-3 in Part One talk about the basics of Down syndrome. Forget Google. This is a great resource. And I love that it includes all the information. It’s not a “unicorns and rainbows” approach. It’s real. It talks about the medical challenges that your child may face that are more common our special kids. And while it also talks about the great things, it doesn’t sugar coat some of the more ugly things. It’s real. And throughout the entire section, the tone is one of hope, encouragement and most importantly, it’s a tone of community. Regardless of how the news is/was delivered to you, whether it’s a Down syndrome diagnosis or another medical challenge/diagnosis for your child, imagine if the very first words you’d heard were “We understand how you are feeling. It’s OK! You are not alone!” What a different experience. THAT’s how this entire book is written. I love Part Two. That’s where our family “lives” – smack dab in the middle of this incredible journey. And in this section which covers the journey from the days of a newborn to the life of an adult with Ds, words you’ll continue to see are things like “may”, “can” and “perhaps”. Recognition that your journey is unlike anyone else’s. You’ll read differing opinions on parenting choices such as therapies, schooling choices, etc. It’s a plethora of information but never pushes any singular agenda. One of the tremendous responsibility every parent has by virtue of the gift of a child/children, whether via birth or adoption or any other process, is the responsibility to make choices YOU believe are best for your child. Will we get it right all the time? Heck no. Probably not even most of the time. But how nice to read about other people’s choices and the results/consequences of those choices so that we, as parents, have a perspective other than our own. And how special that these stories are told not to tell you how to parent your own child, but to show how other parents/families have coped with making some of the same choices you may face in parenting your child. Lastly, Part Three: You Are Not Alone. I can assure you, you’ll never make it to Part Three wondering if you’re alone anymore. If you picked up this book fearing you were alone, you got the message on Page 1 of the Introduction that you aren’t, and it was hammered home in every single page that follows. But giving the reader a section of resources to refer back to was so smart. Paul and I are so thankful to be on this journey with so many amazing people in the world of Down syndrome. We didn’t ask for this, but we certainly are glad we were deemed worthy to be chosen by God to parent this very special little boy and by virtue of that tiny little extra chromosome, to be embraced and loved by this community of people who have walked, are walking or who are about to walk in our shoes. None of our journeys as parents are the same, and that’s true for those of us who happen to be fortunate enough to be parenting a child/children with Down syndrome. The Parent’s Guide to Down Syndrome is the perfect resource for advice, inspiration, information, support and love for those of us on this particular journey. Kudos to you, Jen & Mardra, for putting into words what so many of us feel in our hearts.